The groundhog is also known as a whistle-pig, due to its tendency to make a whistling noise when predators are near. Much as monitoring systems will send SMS or email messages when an attack occurs. Groundhogs have two layers of fur, both a soft undercoat and a guard hairs. This is a classic defense in depth strategy, against both cold and damp threats. Groundhogs mostly eat plants won’t pass up the occasional delicious grub or bug. This allows them to supplement their dietary needs without having to track down the rare vegetative high-protein source like nuts or beans, which are needed in small quantities at various points in their lives. This is much like an organization hiring a 1099 resource as needed. They are one of the few creatures that truly hibernate and are generally utterly non-responsive for four to five months… which has no direct correlation to business, but there are days when I wish it did. They have a wide range of predators, including owls, dogs, bears, bobcats and coyotes. Younger ones are vulnerable to snakes and hawks. Much as a security program is constantly evolving and loses vulnerability to some threats but not others, the successful groundhogs grow large enough to be immune to the snakes and hawks. 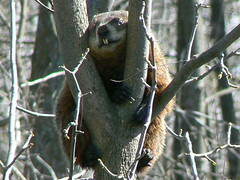 When predators strike, groundhogs will escape them by running to emergency burrows (hot site) or up a tree (cold site). Groundhogs are mostly solitary but also live in small communal burrows. This allows them to share the alerting responsibilities and leverage one another’s expertise… in much the same way that small teams can work most effectively in a small conference room where they can collaborate. The groundhog is in the Sciuridae family along with the squirrels (and a fragment of their genetic code can be found here (as part of the SequenceJuxtaposer project (which has nothing to do with security, but is still pretty neat))). Image in the Creative Commons and is courtesy of ~Sage~ on Flickr.